Our main office is based on Deangate in the centre of Manchester, meaning we’re privileged to spend every day working in historic, innovative surroundings. 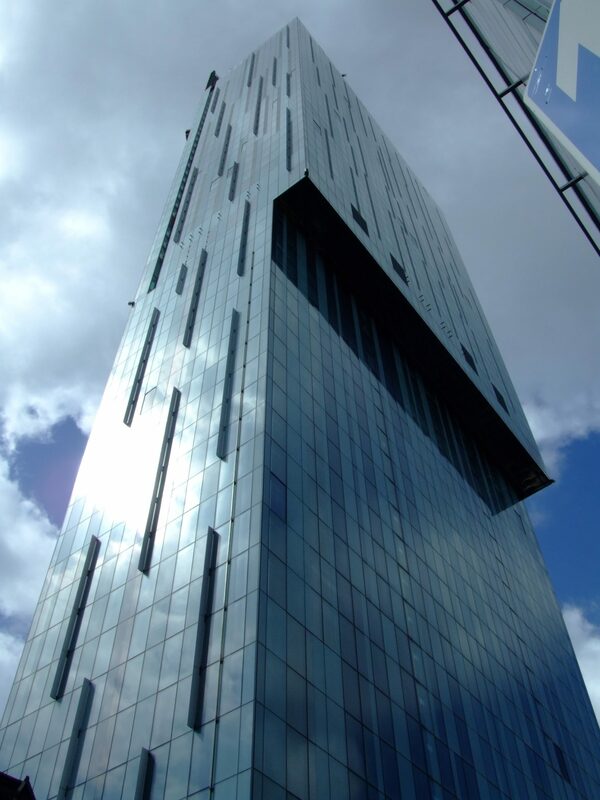 Manchester has a unique mix of modern, eye-catching architecture, and impressive, long-standing buildings steeped in history. Beetham Tower is a building that splits the city, with some lauding it’s unique, innovative design, and others criticising its intruding style amongst its industrial, historic surroundings. The tower is probably one of the most recognisable landmarks of Manchester, with it visible from many miles out, and able to be seen from ten English counties on a clear day. It’s one of the first things anyone sees as they approach the city, but it’s not all about the view from afar. A large portion of the building is taken up by a Hilton Hotel, while the rest is occupied by private tenants. However, up on the 23rd floor of the building is the popular Cloud 23, a cocktail and champagne bar that offers exclusive, stunning views of the city. It’s a great place to go for tourists who want to experience the views, while enjoying a drink in high-end surroundings. 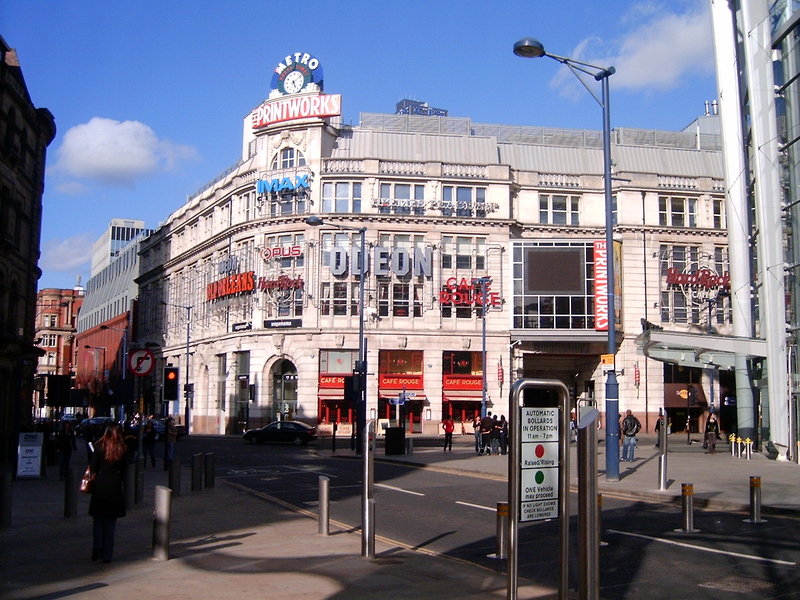 The Printworks is now a hub for entertainment and leisure, with a cinema, escape rooms and a host of bars and restaurants, but it’s not always been that way. The building’s name comes from its historic use as a newspaper printing house, with the venue the business premises of 19th century newspaper proprietor Edward Hilton. In fact, the building constantly worked as a printing press until 1986, when it was shut down before falling derelict over the following decade. It was only after the IRA bombing in 1996 that the area began to be redeveloped, with the building transforming into the entertainment centre it is now, opening in 2000. The interior design reflects the building’s industrial history, with plenty of nods to it’s paper printing past. 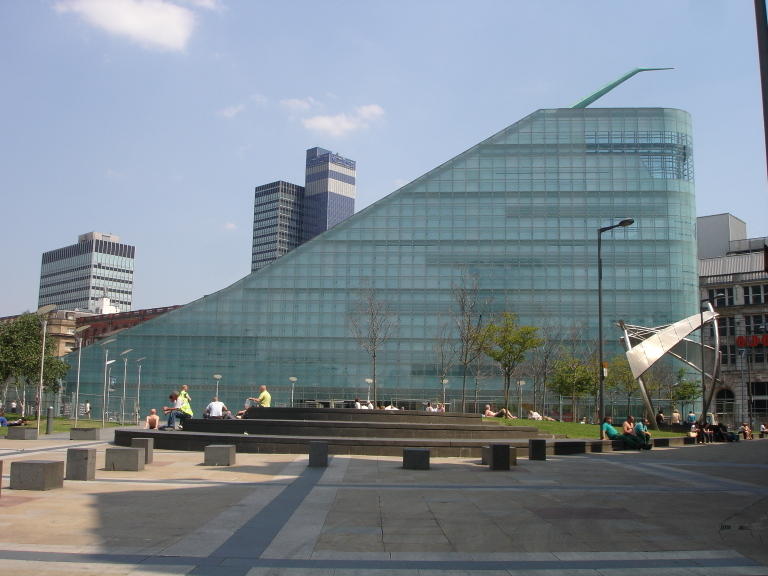 The Urbis is another building that gets attention due to its unique design, which like Beetham Tower, was designed by local architect Ian Simpson. The thin, sloping building officially opened in 2000, operating as an exhibition centre, hosting temporary events and galleries on a rotating basis across its five floors. After a decade of operating in this fashion, the Urbis closed in 2010 to begin a large-scale renovation, transforming itself into the new home of the National Football Museum, previously located in Preston. Opening in 2012, the move was a success, with the museum now one of Manchester’s most visited attractions, holding historic memorabilia from the country’s most loved sport. 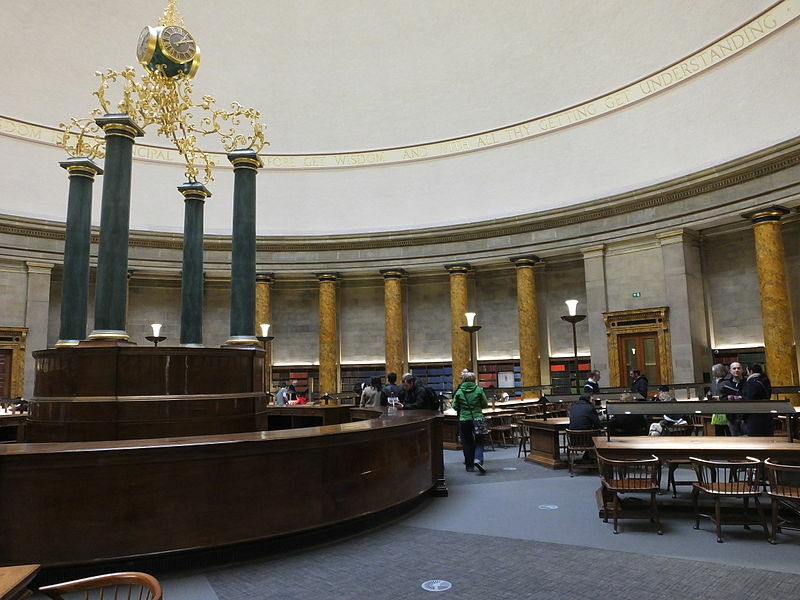 The Central Library is absolutely one of the most beautiful of the city’s buildings, constructed in the early 1930s, and definitely being one that will be appreciated by those with a keen interest in classical architecture. The stunning design isn’t just on the outside of the building, with particularly breathtaking decor on show in the huge Wolfson Reading Room, and the Shakespeare Hall. The building hosts several important collections, including many rare, historic books, including some published before 1500, and the entire works of Elizabeth Gaskell, a hugely successful novelist who lived and worked in Manchester in the 19th century. St Ann’s Square is another of Manchester’s most historic areas in terms of architecture. Many of the buildings in the area have stood since the 18th and 19th centuries, with St Ann’s Church the most iconic. 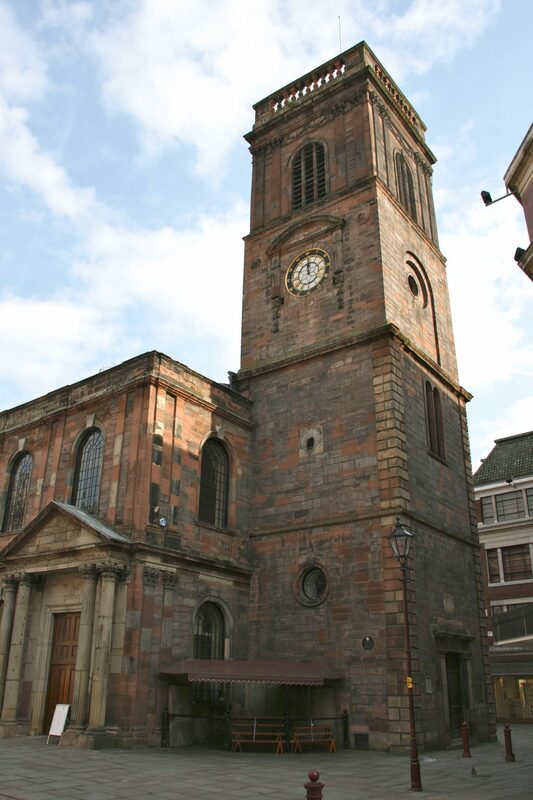 St Ann’s Church opened in 1712, with a beautiful design that stands out amongst many of Manchester’s best buildings. The history of the church is rich, built when Manchester was nothing more than a small rural town, while the church tower still has a visible mark formerly used by surveyors as the mark of the city’s centre. The entire square is well worth a visit, especially when the Christmas markets are on later in the year. It also became a place of international prominence when thousands of people placed tributes there in memory of those who lost their lives in the 2017 arena bombing. It’s not technically one of the city centre’s landmarks, but it’s one that anybody visiting Manchester should see. 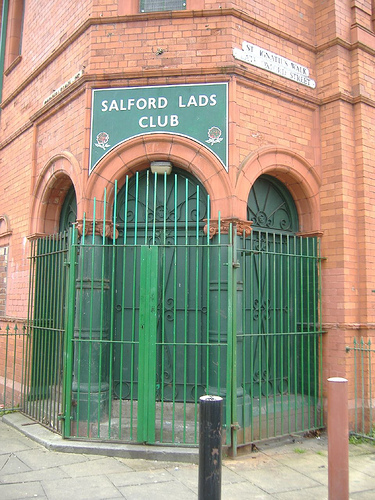 Located in the closely neighbouring city of Salford, Salford Lads’ Club was built in 1903, as a recreational centre for boys, and to this day retains the majority of it’s original design. But why is it considered iconic, and how did it become well known? Well, it rose to fame in 1986, when one of Manchester’s biggest musical exports The Smiths posed at the front of the building for the cover art of their third album “The Queen Is Dead”, also featuring it in the music video for “There is a Light That Never Goes Out” from the same record. As a result of this inclusion, the front of the building is now a tourist hotspot, with music fans flocking to have their photo taken where The Smiths once stood. We earlier discussed Central Library, which is located in St Peter’s Square, an area that is home to even more iconic buildings. As well as the library, the square is home to an extension of Manchester Town Hall, built in 1938 with an imposing gothic style. It’s also where you’ll find the Midland Hotel, opened in 1903 – its rich history saw the Queen Mother dine within it, and was also where Charles Rolls and Henry Royce met, later forming Rolls-Royce. The hotel was also said to be keenly sought after by Adolf Hitler in WW2, who apparently avoided bombing the area to maintain it for future use as a Nazi headquarters in Britain. Manchester’s Cenotaph is located here too, commemorating the First World War, with additional memorials surrounding it for later conflicts. 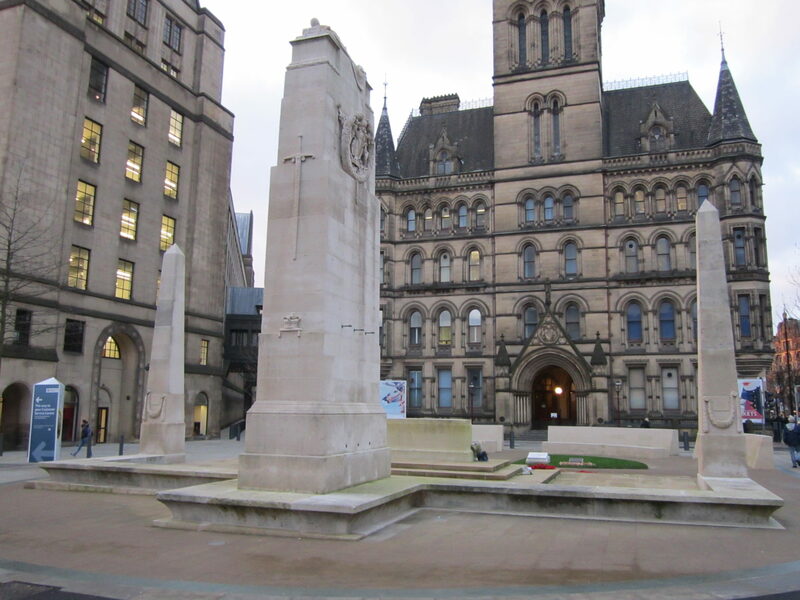 The memorial was unveiled in 1924, and to do this day is still the centre of Manchester’s Remembrance events. Even further back in history, St Peter’s Square is of significant importance due to being the area where the Peterloo Massacre took place in 1819, a major event which has shaped the country’s political and democratic landscape. 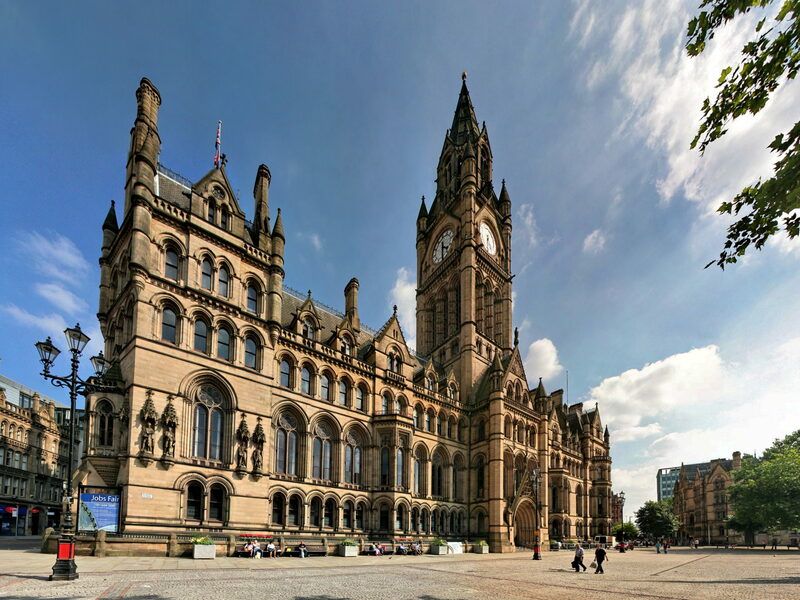 Easily one of Manchester’s most well known, iconic buildings is the Town Hall, the headquarters of Manchester City Council which opened in 1877. The building is lauded for it’s stunning gothic revival architecture, which replaced a previous town hall deemed to small thanks to the city’s industrial growth as a textile hub. 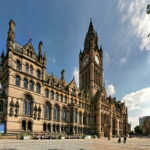 Whilst the area outside of the Town Hall, Albert Square, has been used regularly as the home of the Christmas markets and light switch-ons amongst other events, the hall itself closed down at the start of 2018 for a large scale six year restoration, set to cost around £330m. The extension in St Peter’s Square continues to operate whilst the main building sets about being restored, after it was deemed in desperate need of repair.